Mechanical Bellows & Production Tube End Forming are just 2 types AMH creates. We also custom design Liquid Hydro Bellows Metal Forming Machines, Segmented Expanding and Reduction, Heavy Metal Pipe Bending Machines, and Hydraulic Presses. AMH Quality Bellows and Tube End forming machines! Since 1962, AMH has been a Leader in the innovative design of quality Liquid Hydro Bellows, Mechanical Bellows, Production Tube & Tube End finishing, as well as fabrication tools for bending and forming metal tubular shapes. All American Machine and Hydraulics equipment is available with a wide range of controls, performance and safety features to meet the most demanding client requirements...we can meet your needs no matter the size or complexity! If you have any specific tasks, duties, or needs for any of our machines, we can custom tailor and fabricate one to fit your specifications, tolerances, and production needs. Please call us at (805)388-2082, to speak with one of our experienced engineers. We look forward to working with you, and servicing all of your production needs for another 30 years! 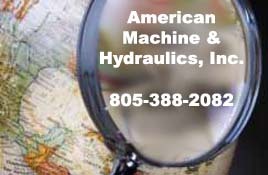 Here are some of the machines we create:Liquid Hydro and Mechanical Bellows Metal Forming Machines; Production Tube End Forming Machines; Metal Hose and End Finishing Equipment; Metal Pipe Expanders, Metal Tube/Pipe Swaggers; Tube/Pipe Benders; Hydraulic Presses; and Custom Hydraulic Equipment. Click here to see a gallery of our high quality machines and learn about their functions and capabilities. In many cases, AMH will sell its detailed schematics to a specific customer. The reason for this is economics. When companies are not budgeted to purchase production equipment, buying our engineering and producing it themselves becomes economical. When we sell our engineering, it is a complete package. The package includes a bill of materials on auto-cad CD. It also includes detailed service and maintenance manuals, which contain all electrical, hydraulic and pneumatic information. AMH will only sell engineering material and designs to companies that are going to build the product in-house. Companies must sign a Non-Disclosure (NDA) and Responsibility Acceptance Agreement (RAA). AMH has designed hundreds of machines that have greatly improved the manufacturing capabilities for companies World Wide! AMH is an Industry Leader and Innovator, so don't be fooled by cheap imitations that could possibly cost you more down the line. AMH designs machines that will fulfill your manufacturing needs quickly, and it will pay for itself 10 times over and continue to work. Our goal is to design a solution that is simple, effective, and user friendly. We also provide consulting to evaluate your current Production Systems, Processes and Equipment. Sometimes companies need a fresh pair of eyes to provide a non-prejudiced evaluation and experience backed recommendations. Contact AMH Today for a FREE Consultation, and let us help you take your Manufacturing and Production to the Next Level! Click here to request an initial consultation or call AMH at 805-388-2082. AMH creates a variety of Liquid Hydro Bellows & Mechanical Bellows Forming Machines, Tube End Finishing and Bending Equipment, along with Hydraulic Presses. By selecting "Examples" from the menu, a wide number of tubing products will be displayed. Simply click on the Machine which most precisely meets your requirements, then give us a call at (805)388-2082 to determine if the machine you're interested in meets your needs or requirements. You will find a general description and specifications on the equipment, but again please give us a call so we can expertly guide you to the machine you should be viewing for your specific applications. If you do not find a configuration which represents your objective, please call us and arrange to send us a drawing or schematic of the product you wish to produce. Be as specific as possible with your requirements, including production rates, for us to provide an accurate quote. Since our machines are high and low production, this is very important in determining the cost.